Our journey into the Dixon Ticonderoga continues. Now I plan to take it apart. That’s right. It’s not something that anyone normally does. I mean, even automotive magazines that review new cars don’t take the engines apart to see what’s inside. That’s a shame in my mind though. Imagine how different the review would be and what their recommendation would be! So, let’s rip these pencils apart and see all things that Dixon never wanted us to see. We start first by cutting off the ferrule and eraser from the pencil. The goal here will be to isolate the eraser from the ferrule from the pencil. That means we need to cut at least three pencils. Here goes. Cutting three at a time is difficult due to the required grip on the pencils and cutting one at a time is inefficient. So lets cut two to begin with. Now we have four little pieces. First, let’s examine what’s under the crimp in the ferrule. We’ll carve out the eraser and peel the ferrule off by making a small slit and pulling on it. Now that’s a bit of a surprise! If you look closely at the picture above, I have photographed all six sides of the wood casing that was under the crimp. 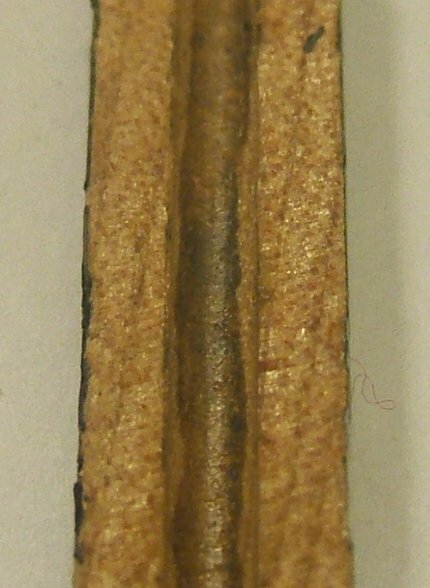 Some of the lacquer chipped off during the isolation process but the crimping indentation is still obvious. Sides 1 and 2 show the vertical crimping indents seen on the outside of the green and yellow ferrule. There is also a wide section of seemingly polished/shiny lacquer and a bit of a step up to the vertical bands. This looks good so far. You can also trace the rotation between sides 1 and 2 by following the bit of exposed wood that looks like somewhat like a backward letter L. The casing fragment was rotated right to left. The vertical bands now disappear from side 3 and the step that lead to the vertical bands is missing as well. This continues on all the way to side 6. Also notice that the wide band below where the vertical bands were changes. It is no longer smooth and shiny. I would guess the smoothness and shininess comes from the compression of the lacquer and the rolling pressure from the machinery during the crimping process. This to me implies that there is uneven pressure during this process. I repeated this with the other cut pencil and found the same features to a lesser degree. Frankly, I am extremely disappointed at this. I am convinced that Dixon is consistently inconsistent in their crimping process. Now let’s isolate the ferrule from the eraser and from the wood. I did this by drilling through the wood and the eraser and by using the drill as a milling machine. Just stroke the ferrule back and forth across the drill bit as the drill bit spins. After that, I simply picked away at the thin bits of wood and eraser before slicing the ferrule open and spreading it out. Another surprise showed itself here! 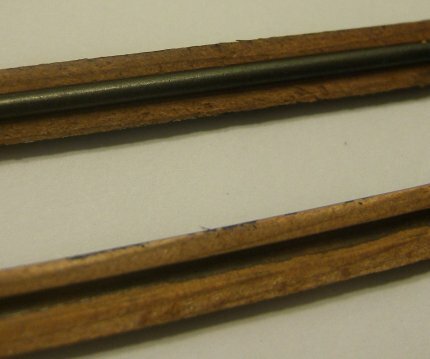 The little bits of wood, lacquer, and eraser are strongly bonded to the ferrule! I can only guess that the lacquer was not completely dry when the eraser and ferrule were crimped on. The lacquer squeezed out where it could before it finally dried and acted like a glue between all three pieces. This would allow Dixon to get away with the poor crimping to the wood casing. I suppose from a manufacturing engineers point of view this is OK because almost nobody would notice it, it gives a strong bond between the pencil, ferrule, and eraser, and it takes the pressure off of having a uniform crimp. Who knows if one bright engineer, caught in a bind, was making up for another? Next, let’s isolate the eraser from the ferrule and the wood. 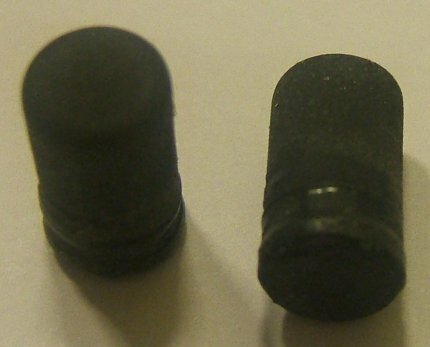 The crimping indents are clearly visible on both erasers shown above. It is not easy to see on the left hand sample but some eraser is missing because it is stuck on the ferrule. I apologize for the blurry pictures. The camera seems to have focused better on the right hand side. I am actually quite impressed with the performance of the erasers. As I mentioned in my last post, the eraser leave little residue, work gently, and remove the markings very well. So what is the inside of the eraser like? Cut in half twice, the erasers showed a uniform texture with no clumps, harsh bits, or air pockets. It was very soft and cut very smoothly. Imagine cutting soft butter with a warm sharp knife. In the end, I cut more than three pencils. I went through five in all. Dissecting a pencil is not as easy as you may think. After grinding through my first one, I saw how I could do it better. My next move is to crack the pencil case open. This is actually easier than you’d think. Maybe I just got lucky. 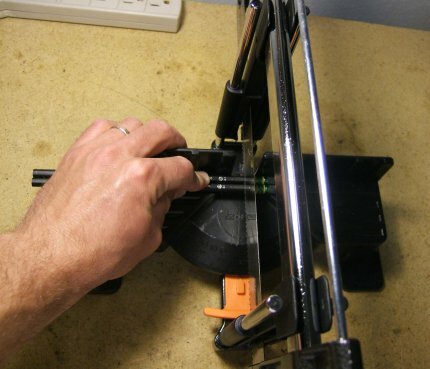 Simply put one end of the end into a vise with the wood case seam being pressed against the vise jaws. Slowly and carefully close the vise and crush it. The two halves will begin to separate because they begin to bulge outward. Once the separation has begun, take the pencil out and carefully peel the two halves apart. You can slip your finger nail between the two halves on one side and just slowly crack it open. Repeat for the other side. You should get something like this. Even from the small picture above, you can begin to see one major issue with the casing. It isn’t centered! 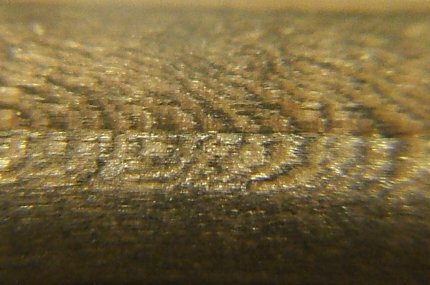 In the bottom half of the picture, you can see the groove where the lead would sit. There is more wood below the groove than above it. Take a closer look. At least the alignment is consistent along the length of the casing. A crooked groove would have been even worse. It is also interesting to see how much (or how little) glue is used to hold the wood and lead together. Follow the black line in the groove. 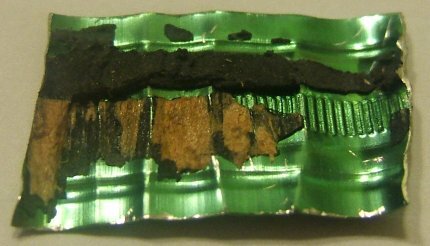 This is where the outer layer of the lead seems to have stuck to the wood when the casing was being split in half. Now let’s try to remove the lacquer from the wood. There are two ways to do this. First, you can sand it. Sanding the lacquer off gives an exceptional smooth pencil and it feels wonderful to hold. There’s nothing like a holding a smooth piece of wood! The wood has a gentle grain and does not show any defects like knots or splits. The problem with sanding is that is can potentially remove any minor defect in the wood that was covered up by the lacquer. This brings up the second way to remove the lacquer and that is by a chemical process. It sounds easy but it’s actually quite hard to do. This is a wonderful testament to the durability of the lacquer. I spent a lot of time with a paper towel and nail polish remover trying to get the lacquer off. Most of it did come off but some residue remained, especially in the grain of the wood. I was actually impressed with how hard it was to remove. Take a look at the extreme close-up shot below. There are two main features to observe. First, you can see the seam from the two halves of the wood. Look for a faint horizontal line across the middle of the frame. Second, you can also see the wood grain and lacquer residue. The residue allows us to see the roughness of the wood. Could this roughness be an indication of how well the casing is cut and shaped? You can be fast or smooth – but rarely both. 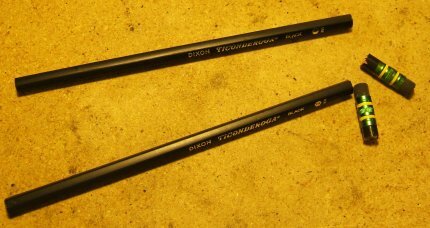 Now we can finally wrap up the review of the Dixon Ticonderoga #2HB! Stay tuned for the conclusion in Part IV!